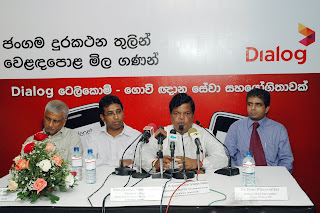 Minister of Trade, Marketing Development, Cooperatives and Consumer Affairs, Bandula Gunawardena, is addressing gathering at the launch on 22nd December 2009. Dialog Telekom, a telecommunication company, together with Farmer Intelligence Services [Govi Gnana Seva (GGS)] has launched a service to deliver spot and forward agricultural commodity price information via mobile phones. Dialog tradenet is a project initiated by the Dialog’s ICT4D team to go beyond the conventional entertainment focused Value Added Services and make a meaningful relevance of ICT to the all the segments of the society, especially to the Bottom of the Pyramid (BoP). So everyone will be able to reap the dividends of ICT for their own socio-economic development. Initially this will provide agri-produce price information from three Dedicated Economic Centres in Sri Lanka (Dambulla, Meegoda and Narahenpita). The scope of tradenet will be gradually expanded to industrial and service sectors also. GGS, as an organisation with the expertise on agriculture markets has joined with a technology expert, Dialog to make this initiative a success, by making it a win-win-win solution for all, including the poor farmers. Among many other unique features, the usage of multiple channels/technologies to reach the end-users has made the system Affordable, Available and Accessible to the all the levels of the society including the BoP. Moving farmers from subsistence agriculture to some level of agri-business will help them to come out of poverty. But for those poor farmers to actively participate in agri-business we have to create efficient agricultural markets with minimum information asymmetry. Sri Lanka farming community accounts for over 50 percent of the workforce but are mostly poor, despite being given subsidies and handouts by governments seeking their votes. A glut in agriculture produce during harvest time drives prices down and the excess produce is often thrown away, which can be eliminated by linking cultivation with the point of sale through better information flows. Often it is more difficult than it appears to solve traps in agriculture sector, and bringing a case of cell phones will not solve the problem. I partially agree with you, yes it is difficult to solve the all issues, but it can help to minimize the negative impact. As an example we will not be able to eliminate the exploitation of farmers by the middle-men. But the information will empower the poor farmer to negotiate for better deal. Hi! Admin... now you can also easily and efficiently manage employee’s usage of Business Mobiles services and increase productivity and responsiveness of your business So Quickly Get a Best Business Mobile Phones Deals.